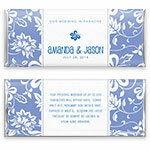 Celebrate your destination wedding in style with this tropical-inspired wrapper design. It's also a perfect choice for any tropical or beach-themed reception. Design: Tropical hibiscus background pattern with a white text banner. Personalization: Front message, names and date with a back message.